My first encounter with authentic falafel was few years back when I visited middle eastern countries. I was completely bowled over by this famous middle eastern fastfood, the texture, the colour, the flavours and crispness they had. 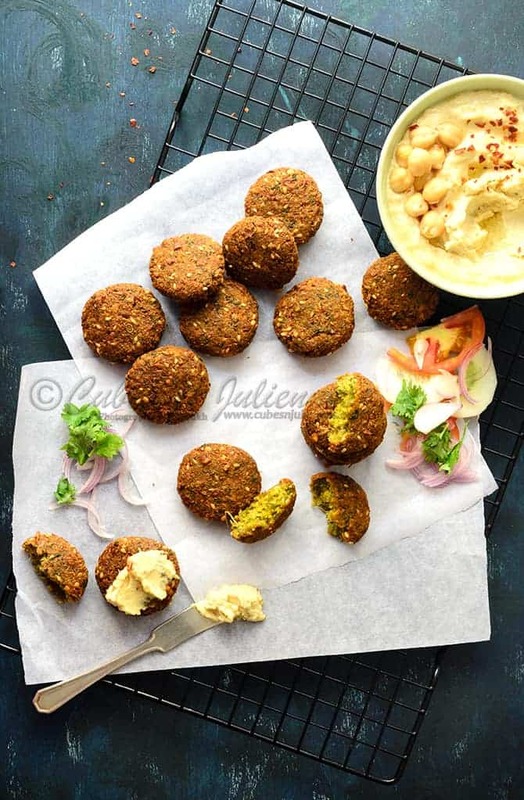 Falafel is basically deep fried crisp chickpea patties or balls seasoned with herbs and spices. These yum crisp patties are very well loved by almost everyone. They are usually served in pita pockets dressed with tahini dip/hummus, pickled veggies, salads. In Egypt, they are usually made using fava beans but most of the other middles eastern countries opt for Chickpeas. When made with fava beans, it requires prior cooking whereas with chickpea, no prior cooking is done. They are soaked, drained, blended, seasoned and cooked. 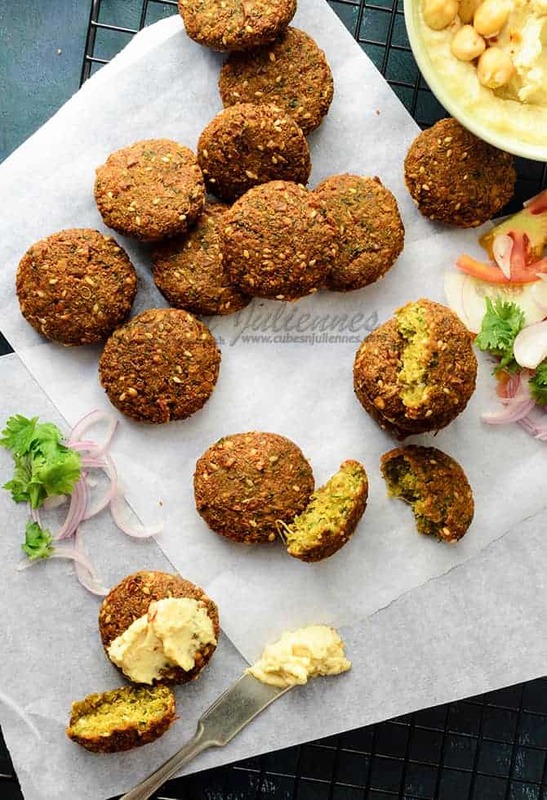 Since Ramadan is approaching, this is the best time you can make these falafels in bulk and freeze them. They just require the frying straight from the freezer and you have your iftar snack ready. All you need to do is, make the mixture the way I did, make patties, spread on a tray or cookie sheet, allow them to freeze for few hours, assemble and pack them in Ziplock bag. Even if you are making it in bulk, you can freeze one batch while rest of the batch can easily stay in your refrigerator for a day. Proceed with freezing of the other batches.How easy it is to enjoy best home made falafel any day or anytime! 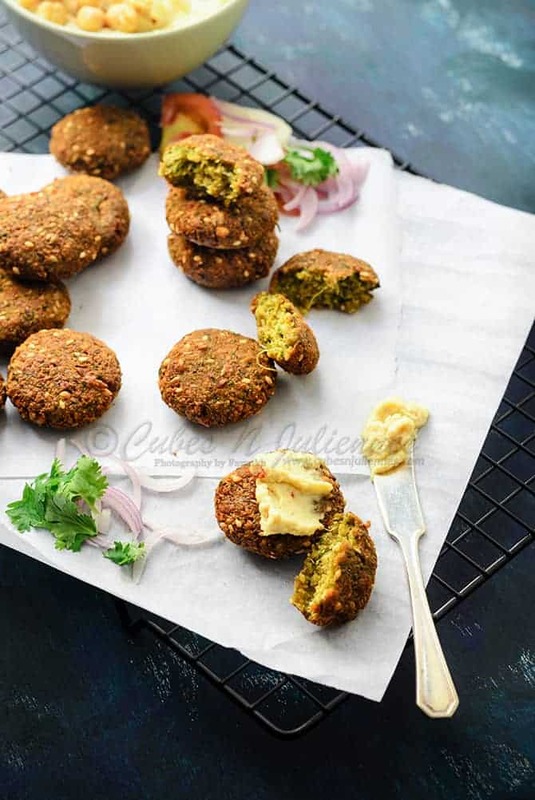 So let’s go through how to make authentic Middle Eastern falafels at home …. In a chopper or blender, add 1 and 1/2 cup of soaked chickpea, parsley, coriander leaves, roughly chopped scallions, garlic cloves, cumin powder, coriander seeds,lemon zest and lemon juice. Blend it to a coarse paste. Take out the mixture in a clean large bowl. Add maida(apf) baking soda, sesame seeds, chili powder, salt and pepper. Mix all the ingredients very well. Divide the mixture into equal size ball and flatten each of them to make a patty. Refrigerate the patties for couple of hours.I rested them for overnight in refrigerator. Heat enough oil in deep bottom pan. Once the oil is hot enough, lower the flame to medium and fry the falafel until golden brown and crisp. Do not overload the pan while frying and do not fry them one very high heat. Can u use canned chickpeas? 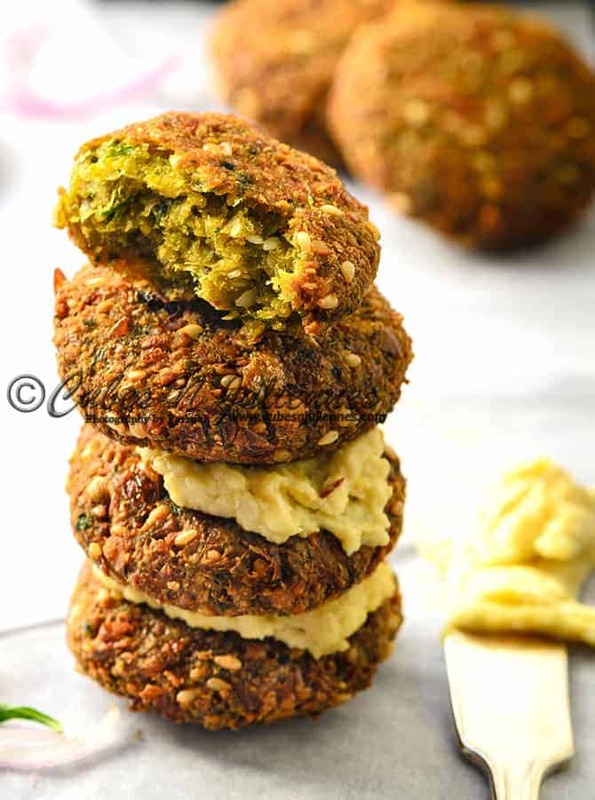 Superb….thanks a lot for all these recipes….hummus n falafel is my favourite …..
Post the recipe of pita bread n veg pickles toooo….